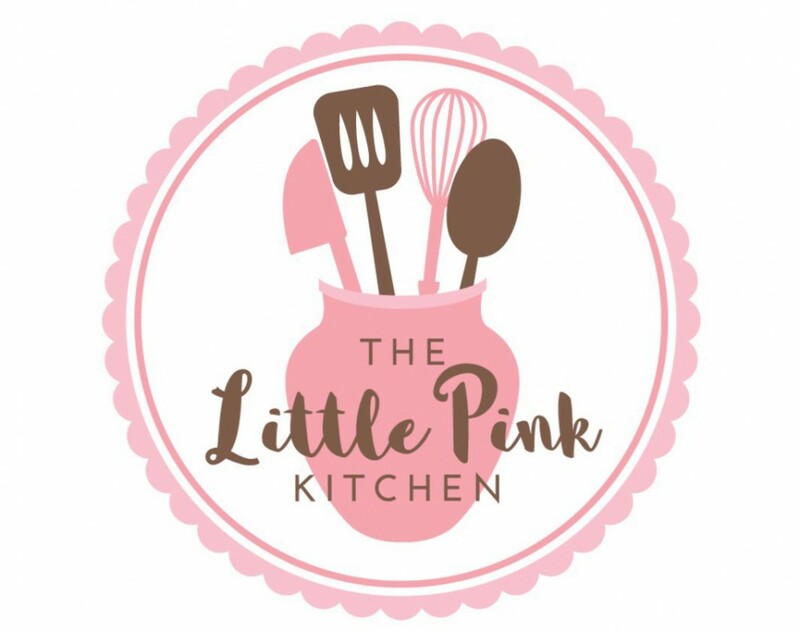 Some of you already know about the Sunday Baking Club on Twitter, where a weekly baking theme is set, people bake something, post a photo of it and then could be in with a chance of winning the (virtual) Golden Spoon Award for the best bake of the week. If you don’t know about it, you are missing out so go and have a nose on Twitter for @SundayBakeClub. During the summer holidays while the founding ladies are taking a break, some of the members are covering and are using @SBCTakeover as the Twitter handle. I had the pleasure of running yesterday’s Twitter bakeathon and I chose the subject of “savoury bakes”, which attracted quite a number of entries. I took a very brief break from my diet so that I could also take part and I decided to make savoury muffins. Yup, not your standard sweet or plain fluffy muffin, but one that was a bit different, that would make a flavoursome light lunch, tea or snack. 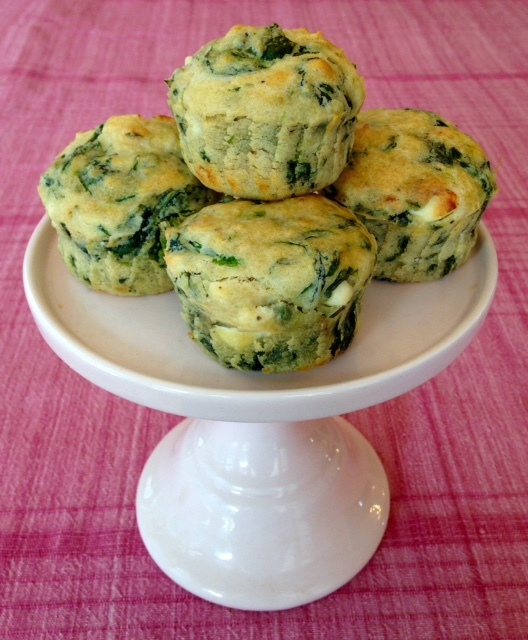 The other essential thing was that the recipe had to be quick and easy and so my all in one recipe for spinach, feta and garlic muffins was created. This was largely because I had a bag of spinach in my salad drawer that really needed to be used up along with a small chunk of feta cheese that wouldn’t keep forever. The resulting muffins exceeded my expectations taste-wise. The solitary clove of garlic really came through and complemented the feta well. I used rapeseed oil as I find it lighter than olive oil, but if that’s what you have in your cupboard I think it would work just as well. In this case, the rapeseed oil gave the finished muffins a nice golden colour that contrasted well with the green of the spinach. I would say that you shouldn’t expect these muffins to be ‘fluffy’ like sweet ones can be. These are denser – although not as much as scones – and therefore if you have one (or even two!) with some salad, you feel you’ve had a nicely satisfying light meal. 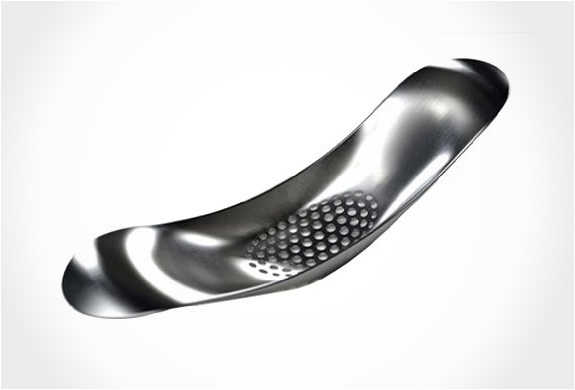 With regards to the garlic used in the muffins, I used my metal rocking garlic crusher from “Joseph Joseph” (see photo below) that I bought about a year ago to get nice small, even pieces. I’ve given up on most garlic squeezers as you often end up with great big chunks and a load of juice. This one can be cleaned under a tap and to remove the odd stray piece of garlic, you can poke through the holes with a cocktail stick. I found that one medium garlic clove suited my taste buds in this recipe. Feel free to experiment with the quantity if you make these yourself. I used baking cups for my savoury muffins (as that’s what was in my baking supplies cupboard) but you could also use the larger sized cupcake or muffin cases. If anybody wants to have a go at making these muffins, here’s the recipe. Fill each muffin case with batter – yes I do mean pretty level with the top. Bake in the preheated oven for 25 – 30 minutes. Do not open the oven door before 25 minutes or you may have ‘muffin sinkage’. Place the muffins to cool on a rack although they taste best when they are still warm. A dollop of butter makes them even nicer. The muffins can be kept in an air tight tin in the fridge for a day or two – you can zap them for 30 seconds in a microwave oven to soften and warm them up. I’d love to see photos if anyone makes these! What lovely muffins! I missed SBC again this weekend, fingers crossed I can take part this week!